The second book (after Ship of Magic) in Hobbs's Liveship Traders trilogy solidifies the series's promise as a major work of high fantasy, reading like a cross between Tolkein and Patrick O'Brian. Protagonist Althea Vestrit is neither unrealistically beautiful nor mindlessly dauntless. She is a very human character who has her share of doubts as she undertakes to assemble a motley crew of allies (including her former lover, Brashen Trell) to take the blind, insane liveship Paragone to sea in search of the Vestrit family's liveship Vivacia. Meanwhile, Vivacia is enjoying a prosperous career as the flagship of pirate Captain Kennit. In spite of his peg leg, Kennit is a charismatic leader, with a genius for manipulation that his mistress Etta and his prisoner Wintrow Vestrit (Althea's nephew) seem ready to mistake for virtue. And in Bingtown, Wintrow's bratty sister, Malta, finally starts growing up when her family and town face ruin and she must take refuge in the Rain Wild forests. 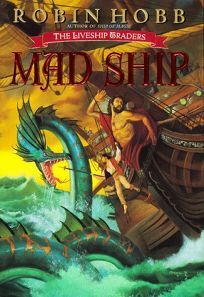 This second installment in the trilogy reveals the connections among liveships, the wizardwood used to build them, the sea serpents and the legendary Rain dragons. Apart from an overly long subplot concerning the feckless young Satrap, the novel is tightly written, with few passages not devoted to characterization, world building or action. Again, Hobb gives high fantasy a salty nautical spin that will please a great many readers. (Apr.) FYI: Robin Hobb is a pseudonym for Megan Lindholm.